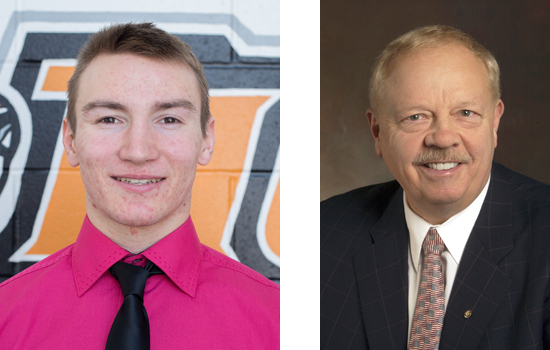 RIT men’s lacrosse captain Matt Hossack, a fourth-year mechanical engineering student from Port Perry, Ontario, Canada, and Barry Culhane, executive assistant to President Bill Destler, will be honored at the 67th Annual Rochester Press Radio Club Day of Champions Dinner on May 31 at the Joseph Floreano Riverside Convention Center. Hossack is the Rich Funke Jr. College Male Athlete of the Year, while Culhane will be honored with the Maj. Donald Holleder Award. Hossack, a senior long-stick midfielder, was named the 2015 United States Intercollegiate Lacrosse Association Iroquois National Award as Division III’s Most Outstanding Player, and also earned first team All-American honors after leading RIT to a 21-1 record and a berth in the NCAA National Semifinal. He tallied 28 points on 14 goals and 14 assists to go along with 122 ground balls and 52 caused turnovers. He is a two-time Liberty League Defensive Player of the Year and Liberty League Tournament MVP. In four seasons at RIT, Hossack led the team to 52 straight regular season wins, a 77-6 overall record, and four trips to the NCAA Tournament, including a berth in the 2013 National Championship game. He is among RIT’s all-time leaders with 360 ground balls and 137 caused turnovers. RIT has won seven straight conference champtionships. Culhane, who joined the university in 1974, is a former U.S. Army medic who has gone on to be a key advocate for area military veterans. He has served in volunteer leadership roles with the Vietnam Veterans Memorial Corporation of Greater Rochester, the Al Sigl Center, Junior Achievement of Rochester, Upstate New York Chapter of the Multiple Sclerosis Society, the Rochester Rotary Club and numerous other organizations. In 1995, he received the President of RIT’s Award for Excellence and the Roger Robach Award for his work on the Vietnam Memorial. Culhane received the second Four Presidents Distinguished Public Service Award in 2004. Culhane is also the chairman for the Imagine RIT: Innovation and Creativity Festival. Launched in 2008, Imagine RIT is a campus-wide event that showcases the innovative and creative spirit of RIT students, faculty and staff that attracts 30,000 visitors on a yearly basis.